We would like to thank you for your interest and support of our English language magazine. Unfortunately, RICARDO magazine’s Spring issue will be our last issue. Please know that we are very disappointed by this news. Our subscription base is growing and we have never won so many awards or received so much public and industry recognition. There are two main reasons for our decision. Firstly, the significant distribution cost to different points of sale across Canada is too high for a small publisher like ourselves. In addition, the revenue previously generated by Canadian magazine advertising has migrated to media such as Google, Amazon, Facebook, Apple and Microsoft. These challenges have become impossible for a family business like ours to overcome. Fortunately, our digital platforms are experiencing more growth than ever as we continue to strengthen our multi-platform offer. Our mission at RICARDO Media is to promote the importance of cooking and eating together. And our most sincere wish is to be able to nourish you with rich, relevant and diverse content. We will continue to inspire you on ricardocuisine.com with more than 6,000 simple and delicious recipes, tips, videos, features, etc. We are also active on social media every day. That’s where you’ll find our recipes, of course, along with promotions, tips and techniques. But you’ll also discover behind-the-scenes content—all that and more on Facebook, Twitter, Instagram, Pinterest and YouTube. To our loyal subscribers, because you still have outstanding issues to receive as part of your subscription, you will receive a letter with your Spring issue (delivered to your door around March 18) detailing the steps to follow in order to receive your refund. If you have any questions or comments, please do not hesitate to contact our customer service department at 1-844-280-7301 or magazine@ricardocuisine.com. We want to thank you for your support and loyalty, and hope to see you on our other platforms. Why decide to close your English language magazine? After considerable reflection, we decided to close the English language version of our magazine for several reasons. Please know that we are also very disappointed by this news. Our subscription base is growing and we have never won so many awards or received so much public and industry recognition. There are two main reasons for our decision. Firstly, the significant distribution cost to different points of sale across Canada is too high for a small publisher like ourselves. In addition, the revenue previously generated by Canadian magazine advertising has migrated to media such as Google, Amazon, Facebook, Apple and Microsoft. These challenges have become impossible for a family business like ours to overcome. Why wasn’t I informed of the magazine’s closure before today? If you didn’t have my email address, how would I have known that the English magazine was closing? All of our subscribers will receive information to this effect with the Spring issue, delivered to your door around March 18th. Which issue will be the last issue? The Spring issue, delivered to your door around March 18th, will be the last issue. How will I be reimbursed for the magazine issues I won’t be receiving? When you receive your next issue, around March 18th, you will find a letter inside the polybag detailing the refund procedure. Can I receive this procedure today? Unfortunately not because we need put the refund process in place, and create the form that will allow you to choose your refund option, on the RICARDO website. As of March 18th you will have four weeks to select your choice. Your refund option form needs to be completed by April 12th, 2019. What refund options will be available to me? We are offering four different refund options that are equivalent to the value of the undelivered magazine issues. 1. A subscription to the French language magazine. You will find all your favourite content from the English language magazine in the French magazine: recipes, features, tips, techniques, food trends, etc. 2. A RICARDO *gift card. Our online store is home to more than 500 kitchen accessories and the Art of the Table collections, along with our new book VEGETABLES FIRST which will be released on April 23rd, 2019. Your card can be used to make purchases at our online store boutiquericardo.com or at one of our boutique locations in Laval, Saint-Lambert or Quebec. You will have 12 months to use your gift card. In addition, by opting for a gift card refund, you will receive more than the actual value of the undelivered magazines. For example, if you are due an outstanding amount of $8.80, we will issue you a $ 10 gift card. Or, for example, if you are due an outstanding amount of $11.47, we will issue you a $15 gift card. Where do I need to go to select my refund option? You will receive a letter with all the necessary information in order to choose your refund option with your Spring issue. Be sure to complete the form before April 12th, 2019 or by telephone at 1-844-280-7301. Your refund will be sent by May 15th, 2019. Your refund will be sent by May 15th, 2019. Unfortunately that is the amount of time required to process our subscriber’s choices. I have an Apple digital subscription. How will I be refunded? You will need to contact Apple customer service via the iTunes Store to obtain your refund. Do you regret having launched the magazine four years ago? Not at all! Having a magazine presence from coast to coast allowed us to position ourselves as a national producer of quality content and has given us the chance to reach readers across Canada. Overall, it was a very good experience for the brand. Will we continue to see Ricardo and the brand outside of Quebec? Absolutely! Ricardo collaborates with the Toronto Star on a daily basis with recipe-based content and a weekly column. He is just as present in print as he is online. 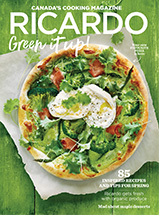 A RICARDO recipe is also featured on a daily basis in the StarMetro newspapers, distributed from coast to coast. Ricardo regularly appears on Cityline and Breakfast Television in Toronto and on Rogers' flagship shows in Montreal. And you can always follow us on social media. We are present on all platforms in French and English. If you enjoy our content, you'll also love our newsletters that will continue to be available in both English and French. The company will continue to develop its brand across the country through various strategic initiatives such as the distribution of kitchen accessories and book publishing. Are you launching another book in English? We are! On April 23rd we will release the book VEGETABLES FIRST, published by Penguin Random House. This book is filled with more than 120 original and delicious recipes that will satisfy both vegetarians and carnivores alike. This book is a translation of the book PLUS DE LÉGUMES, released this fall. Are there plans to close the French magazine? Not at all! The French magazine continues to perform very well. We will be celebrating our 18th anniversary this year, and for the past couple of years the French magazine has consistently been among the top magazines with the best reach in Quebec. It reaches more than one million readers with every issue. Will other RICARDO media properties be closing? No, only the English magazine will be closing. Will you continue to create recipes that are available in English? Of course! Our recipes will continue to appear on our English site, which will also be enriched with additional content. Are there any plans for special issue publications? We are not closed to the idea of ​​continuing to create print content in English. For example, our new book VEGETABLES FIRST—released in French this fall—will be available in English Canada this April. How many people does RICARDO Media employ in total? Counting our restaurants and stores, there are 225 people currently employed by the company.